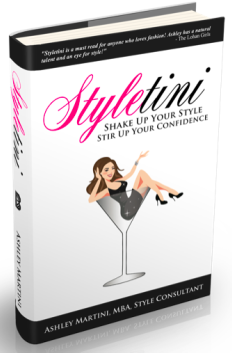 Ashley Martini, MBA, Styling Consultant, Author, Professor, founding member of Martini Fashions, LLC, discretely assists both men and women unearth and exhibit their inner most beauty through style, fashion, and the top most trends. She graduated from Lynn University in Boca Raton, FL with a Business degree where she specialized in both fashion marketing and merchandising. She also completed her Masters in Business with a focus in International Business. She studied abroad in the world’s fashion capital, Paris, France with a concentration in fashion styling and trend forecasting. Ashley Martini vocationed as a styling intern with Jennifer Lopez’s fashion company Sweetface/JustSweet/JLO. She has directed several Fashion Shows and has won numerous awards including the “Project Runway Competition” at Lynn University and the “Sak’s Service and Selling Star Award” while employed as the Reed Krakoff Brand Ambassador at Saks Fifth Avenue. Her clothing has been featured in a variety of fashion shows. Additionally, she was hand picked to participate on the “NYC Prep” Television series in the episode titled, “The Overachievers.” This episode featured upcoming stylists motivated and dedicated to succeed in the fashion industry. Ashley Martini was born with a natural talent and an eye for style and impeccable taste. She has consulted several high-end business moguls, entrepreneurs, athletes, and celebrities. Ashley Martini is a native of Millbrook, NY, but now resides in Gulfstream, FL. She travels nationwide to ensure everyone looks his or her absolute best. The Emergency Dress® is her original patented design, and just one of the many ways she can help you dress to impress without the stress. Visit Ashley's styling website: www.AshleyMartini.com for great styling tips and more information on Ashley's styling services. Also, you may send her an e-mail at AM@AshleyMartini.com.